Henry didn’t get very far, but the man accredited with building the first ‘proven to work’ typewriter was an Italian by the name of Pellegrino Turri, in 1808. We do not know what this machine looked like. However, the friend for which Turri built the typewriter, blind Countess Caroline Fantoni da Fivizzano, wrote numerous letters using the device we which can see. The 19th Century saw European and U.S. inventors toil to produce a successful commercial product of the typewriter but none succeeded until Danish pastor, Rasmus Malling-Hansen, in 1808. Called ‘The Writing Ball’, it looked more like a pincushion. 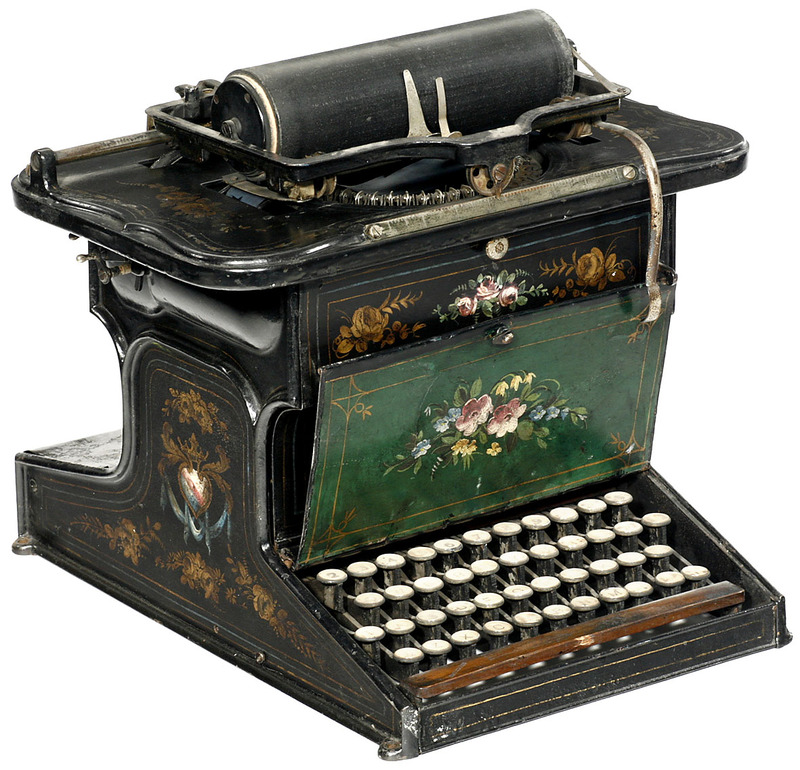 Much more important to the origins of the typewriter was the Sholes & Glidden Type Writer, appearing on the American Market in 1874. Christopher L. Sholes was a Milwaukee newspaperman, poet, and part time inventor. He was the primary creator of the Sholes & Glidden machine which typed only in capital letters and introduced to the world the now famous QWERTY keyboard. The Sholes typewriter had a type-bar system and the universal keyboard was the machine’s novelty, however, the keys jammed easily. To solve the jamming problem, another business associate, James Densmore, suggested splitting up keys for letters commonly used together to slow down typing. This became today’s standard “QWERTY” keyboard. The S&G looked rather like a sewing machine. Given that it was manufactured in the sewing machine department of the Remington arms company, this may come as little surprise. Some of you may be familiar with Remington from movies or game franchises such as Call of Duty. The S&G was not an instant success. After a few years, Sholes lost his patience and sold his rights to the typewriter to Densmore. Densmore, in turn, convinced Philo Remington to market the machine. The improvements made by Remington engineers gave the typewriter its market appeal and sales skyrocketed. The rest is history. > Sholes’ invention was originally designed to print page numbers on books. It was Glidden who suggested using it to type letters. > The longest common words using only the top row of letters on a typewriter are ‘proprietor’, ‘perpetuity’, ‘repertoire’ and ‘typewriter’ itself. > The word ‘qwertyuiop’ also now appears in the Oxford English Dictionary. > But the longest top-row word of all is ‘rupturewort’ (a plant used to treat hernias). > …and Alaska is the only one-row US state. > The Guinness World Record for typing a given 103-character text on a keyboard using only the nose is 46.30 seconds. > According to Mark Twain, his “Tom Sawyer” in 1876 was the first novel written on a typewriter. > Typists were original called typewriters themselves. This lead to some small amount of confusion.